Lance Conley says he is a former preterist, and now presents himself as God’s gift to the theological world to refute the truth of preterism. He is caustic, arrogant and prideful in his comments. On FaceBook his comments are often laced with expletives, something totally unbecoming for anyone calling themselves a Christian. On December 7, Conley posted a lengthy article seeking to counter the arguments that I had made against the Israel Only position on Romans 11:25-27. When I did not respond immediately, Conley began boasting that evidently I realized that I could not answer him. Others joined in boasting of my failure to respond. (It is amazing that every time someone posts an objection and I don’t respond when they think I should – on their time line– that this ostensibly proves that I know I can’t answer them. Yet, when they never – ever – respond to my posts, that means nothing! At least Conley attempted to answer my article, no matter how bad his “response” so I will give him that). Preston would be correct in that these words are neutral as far as the Greek goes and is correct on (sic) the numbering goes. You can translate the words and interpret them in such a manner with the Greek language. Very possible to do that in the Greek language. Mr. Preston even furthers his point by quoting a ton of occurrences in the bible where we are not given exact numbers and are just told they are filled up to the brim as far as they can go like in Mark 8:20 where “When Jesus fed the multitude, they took up twelve baskets ‘full of the leftovers’. We don’t get the full amount of how many leftovers were in the 12 baskets. We can only guestimate the exact amount. However, after admitting that my linguistic analysis is correct, Conley then tried to claim that numbers are involved in Romans 11. This in spite of the fact that he actually came back and admitted that hettema is not numeric but means fault or failure! As I pointed out in response, since hettema is the antonym of pleroma, then if hettema is not numeric as he admitted, then that demands that pleroma is not numeric, thus falsifying his claims. How are we to know that Romans 8 is yet future? It is because of Conley’s presuppositional theology; because he says so! He says that we can know that Paul had the full number of Gentiles in mind because of Conley’s view the elect. Conley, an Eastern Orthodox believer, (not a Calvinist) believes that the elect is a given, fixed, unalterable number. He likewise believes that when the last elected Gentile is converted, the imaginary “end of time” comes. So, underlying Conley’s argument on Romans 11 are two foundational – unproven – presuppositional arguments. Conley imposes those presuppositional concepts onto the context and declares that even though my linguistic analysis is true, and my proof that Paul never- never- uses pleroma numerically, that evidence must be discounted because of Conley’s preconceived views of the election and the imaginary end of time. That is hardly convincing. The Spirit Himself bears witness with our spirit that we are children of God, 17 and if children, then heirs—heirs of God and joint heirs with Christ, if indeed we suffer with Him, that we may also be glorified together. For I consider that the sufferings of this present time are not worthy to be compared with the glory which shall be revealed in us. A word here about context. The old saying is that a text taken out of context is a pretext, and there could hardly be a clearer example of “pretexting” than Mr. Conley’s article. Here is what I mean, based on the fact that Romans 8:16-17 sets the context of Paul’s discussion of the coming redemption. I did a search of his article for the words, “persecution,” “persecuted,” “sufferings of Christ,” “suffering,” “martyrs,” “martyrdom,” “vindication,” “vindicate,” “tribulation.” Not one of those words is in Mr. Conley’s article! Not one of them! And yet, “the sufferings of Christ” being endured by the Roman saints is the context of Paul’s discussion of “the glory about to be revealed.” For anyone to think, and to claim, as Mr. Conley has repeatedly since publishing his article, that he has refuted my view based on an article that absolutely, totally ignores the actual context of the text in view is presumptuous and specious in the extreme. 1. Paul speaks of the Holy Spirit as the “witness to our Spirit that we are children of God.”This witness of the Spirit is nothing less than the miraculous gifts of the Spirit given to the early church to vindicate their claims to being the true children, the true seed of Abraham. This was not some unfelt, unseen, inner “still small voice” of the Spirit, but the overt, active, undeniable working of the Spirit, bearing witness to the identity of the early church. (Mark 16:19-20 / Acts 14:1-3, etc.). Thus, if Conley wants to put the “manifestation of the Sons of God” of 19f into the future, he must of necessity also believe in the current, active, undeniable charismatic gifts of the Spirit. 2. Paul not only says they had the Spirit as the witness to their son ship, but, they were eagerly waiting for the “manifestation of the sons of God.” Thus, v. 16 is inextricably bound to later verses. 3. Conley seems totally oblivious to the concept of Shame-Versus- Glory that was such an incredible and fundamental part of the ANE – and Biblical – thought world of Paul’s day. Simply stated, when a person or nation was conquered, oppressed, dominated, persecuted etc., they were humiliated, they were even considered dead, although patently alive physically. However, if / when they were delivered from that oppression, that ostracism, that shame and humiliation, they were glorified, they were manifested, they were even raised from the dead! This is clearly the thought in Romans 8:17f. The Romans were being persecuted. Like Christ who suffered an ignominious death, they were suffering with him and for him. They were thus, in the Shame-V-Glory thought world, in a body of humiliation and a body of death. But, Paul assured them that vindication was coming, and coming soon – it was “the glory about to be revealed.” We have right here on the pages of the text, the “Shame-v-Glory” motif being laid out for us. Lamentably, far too many Bible students today have any recognition or knowledge of the Shame-v-Glory motif and how dominant it is in the NT scriptures. If Conley has any knowledge of this motif, then he totally ignored it in his comments on Romans 8. 4. Similarly, as just noted, Conley also seemingly disassociates his discussion in verses 18f from the motif of the “sufferings of Christ” found in v. 17. But, verse 17 is the context setting statement! To ignore the context of the sufferings of Christ in any attempt to understand verses 18f is totally wrong. Fatally wrong. Notice that Paul mentions the suffering of the Romans and then says, “for, I reckon that the sufferings of this present time are not worthy to be compared with the glory about to be revealed.” I will discuss the incredible imminence found in this text later. Take particular note of that connective particle, “for” that begins verse 18. It ties Paul’s discussion of the coming glory to their then present suffering, just as he was concerned in his other epistles with the then very present, very contemporary suffering and martyrdom of the first century saints at the hands of the Jewish authorities. What Paul discusses here is identical to what he taught in throughout his epistles and what the other NT writers said about their then present suffering. (Unfortunately, Mr. Conley seems unaware of “audience relevance” in his so-called exegesis). Thus, there is no question whatsoever that Paul was concerned with the suffering of those Roman Christians 2000 years ago. He was not focused on the persecution of the church throughout two millennia, some future unknown persecutors, and some proposed “end of time” as demanded in Conley’s paradigm. What was Paul’s “present time?” He described it as “the now time.” It wasn’t something timeless, vague, elastic or meaningless. Paul well knew that he was living in the pivotal “end of the ages” (1 Corinthians 10:11). He knew and taught “the night is far spent, The Day is at hand” (literally, has drawn near, Romans 13:11f). The motif of the sufferings of Christ, to reiterate, simply cannot be ignored in any discussion of Romans 8. This motif has to do with the early church joining with Christ in his sufferings, to fill up the measure of the eschatological suffering, and as the equal corollary, to fill up the measure of the sin of their persecutors, bringing about the out pouring of God’s Cup of Wrath. For brevity, I will only take note of a few of the many texts that deal with this idea of filling the measure of suffering and the measure of sin. I will list some of the texts that contain the idea but will not comment on them all. ☛ Matthew 21– The Wicked Vineyard Husbandmen killed the servants and the Son of the Master. ☛ Matthew 22 – The guests who were invited to the Wedding killed the servants sent to them. Therefore you are witnesses against yourselves that you are sons of those who murdered the prophets. 32 Fill up, then, the measure of your fathers’ guilt. 33 Serpents, brood of vipers! How can you escape the condemnation of hell? 34 Therefore, indeed, I send you prophets, wise men, and scribes: some of them you will kill and crucify, and some of them you will scourge in your synagogues and persecute from city to city, 35 that on you may come all the righteous blood shed on the earth, from the blood of righteous Abel to the blood of Zechariah, son of Berechiah, whom you murdered between the temple and the altar. 36 Assuredly, I say to you, all these things will come upon this generation. This passage echoes several OT prophecies of the last days and Israel filling the measure of her sin by killing the Lord’s prophets – and Son. This text is normative for the rest of the NT discussion of martyrdom and filling the measure of sin and suffering. See my extensive development of this text and its influence on the rest of the NT in my We Shall Meet Him In The Air, The Wedding of the King of kings. ☛ Matthew 24:8f– Discusses the prediction of 23:31f. Notice the reference to the “beginning of birth pangs” a reference to the Messianic Birth Pains. Paul says that the sufferings of his present time were part of that predicted “birth pangs”– thus demanding that his discussion of suffering, vindication and glorification must be viewed through the prism of Matthew 24, which was fulfilled in AD 70– Matthew 23:36 / 24:34). Conley would have us believe– as his article claims – that we are still in the midst of those birth pains! This is specious in the extreme. In the OT the Lord promised that He would not bring to the time of birth and not bring forth (Isaiah 66:9-10). Yet, Conley and his crowd would have us to believe that God did in fact bring to the time of delivery, the birth pains set in, but, 2000 years later, the church has not brought forth!! That is the longest period of birth pains in the history of mankind! For you, brethren, became imitators of the churches of God which are in Judea in Christ Jesus. For you also suffered the same things from your own countrymen, just as they did from the Judeans, who killed both the Lord Jesus and their own prophets, and have persecuted us; and they do not please God and are contrary to all men, forbidding us to speak to the Gentiles that they may be saved, so as always to fill up the measure of their sins; but wrath has come upon them to the uttermost. Paul does everything but quote Jesus in Matthew 23 here. There is no question that he has Jewish persecution in mind. There is no question that he has the filling up of the measure of sin on their part, and likewise, the filling up of the measure of suffering on the part of the first century saints. It is a gross miscarriage of exegesis to try to apply this text to some far off time and event. And yet, the motif and theme is identical to Romans 8! So, Paul discusses the same thing: suffering and martyrdom, and persecution at the hands of the Jews in both texts. In both texts he promises coming vindication and judgment. In both texts, as we will demonstrate, he speaks of the imminent vindication and judgment. Unless Conley, or anyone, can show that Romans 8 is radically different from 1 Thessalonians 2, discussing a different martyrdom, totally different persecutors, at radically different times, then his claims about Romans 8 are falsified. But again, he did not even discuss – did not mention! – this critical tenet (beyond mentioning the suffering and the glory to come- which he posits as one day by and by) and its link with Jesus’ teaching on suffering, martyrdom and vindication. Evidently, per Conley, Romans 8 has nothing whatsoever to do with the contemporary situation that existed throughout the entire Roman empire – the persecution of the church at the hands of the Jews. I will continue this examination of the context of Romans 8 and how it relates to the rest of the NT data in regard to “the sufferings of Christ” and the manifestation of the Sons of God, in the next installment. Let me close this first installment by reiterating what I stated at the out-set. Any attempt of an exegesis of Romans 8:18f that ignores the context of son ship and the context of the “sufferings of Christ” is totally misguided. And yet, Conley literally said not a word about martyrdom, not a word about martyr vindication. And, he only briefly brushed across the issue of son ship, never even explaining what the manifestation of the sons of God – in context – might possible mean. He simply assumes and asserts that Paul is talking about some yet future time when material creation, ostensibly laboring under his imagined Curse, will be redeemed. As we shall see, that is an imaginary, contrived and invented doctrine that has no merit in the text. So, stay tuned as we continue Responding to the Critics! 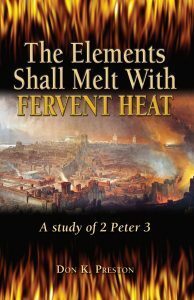 In the meantime, get a copy of my book, The Elements Shall Melt With Fervent Heat, for a discussion of “creation” and the New Creation. The book proves that Conley’s eschatology is fatally flawed.